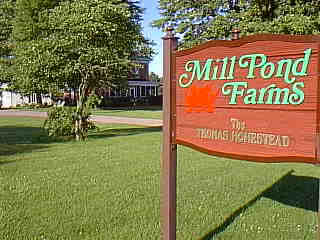 Mill Pond Farms is owned by descendants of some of Venedocia's early Welsh settlers. The farm includes almost all the land immediately surrounding the village. Farm employees wear uniforms that bear the red dragon emblem found on the Welsh flag. The sign shown here and the red brick homestead in the background are located just east of town on Venedocia Eastern Road. The house was built in 1882 by John T.Thomas to replace his log cabin that and can be seen on the 1872 Van Wert County map. Mr. Thomas was part of the second wave of Welsh immigrants to settle in or near Venedocia and he purchased the property seen here in 1852.